It's hard to imagine that the Powerhouse section of the Kern River is only 2 miles downstream from the violent maelstrom of the Cable section and the now infamous Wall rapid. By complete contrast, the Powerhouse run more closely resembles the Nantahala than the Gauley. Long, rocky and shoaly rapids lead into moderate length pools. Occasionally the river tightens up giving us waves and holes, but compared to the past 2 World Cups, this section of the river is a comparative walk in the park. This is the same section that was used ten days ago at the USA Team Trials and National Championships, albeit at much higher water levels. 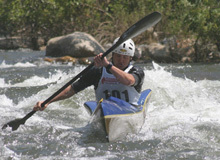 World Cup number 3 is a classic or long race starting where World Cup 1 finished at Kern Beach and ending in downtown Kernville at the Riverside Park approximately 3 miles downstream. With the dropping water levels, this section of the Kern had seriously changed character over the past few weeks. The USA Juniors had an opportunity to Forerun in this mornings race gaining valuable experience for the future. In the C1 class, USA John Pinyerd deemed his shoulder injury healthy enough to race again and caused quite a stir by beating all the other USA C1 paddlers except National Champion Tom Wier, finishing 14th, 2'15" behind the leader: impressive stuff from and old man with a shoulder problem! Wier finished in 10th. Stephan Stiefenhoefer (GER) took the top spot just edging out Vladi Panato (ITA) by over a second. In K1W, Sabine Eichenberger (SUI) de-throned Michala Strnadova (CZE) for the top spot. Team USA was one women short as Marci Cary had broken a rib in training the day before. In C2 Team USA was grouped together in 7th, 8th, 9th and 10th places,with first place not surprisingly going to multiple World Champions Vala/Slucik (SVK). In K1 Kamil Mruzek (CZE) continued to impress with a strong finish almost 4 seconds ahead of Charles Chalet (FRA). 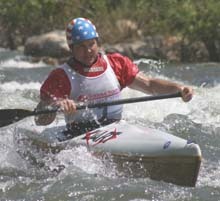 The top USA paddler was Chris Hipgrave in 18th place. He was closely followed by Middy Tilghman (20), Simon Beardmore (21), Eric Giddens (22), Dave Hammond (23) and Austin Krissoff (24). World Cup number 4 is a sprint race through Ewings rapid, the largest rapid on the Powerhouse run, and onto the finish at Riverside Park a deceptively long way further downstream. Once again, this is the same sprint course that was used for the USA Team selection prior to the World Cups. With the lower water levels, this sprint race would be significantly longer that at Team Trials. A strong wind also developed between runs affecting times and boat control. The C1 class saw some upsets. Medal favorite Stephane Santamaria (FRA) continued to struggle, flipping in run one and opting not to start run number two. Vladi Panato (ITA) was dethroned again by Lukas Novosad, placing first and second respectively. Tom Wier remained the top ranked American in 10th place in front of Pinyerd (12),Tom Gray (13), Ed Gordon (14), Bob Bofinger (16) & Mike Beck (17). In K1W, Michala Strnadova (CZE) continued to set the pace winning handily over Sabine Eichenberger (SUI) and Nathalie Leclerc (FRA). Michala's time was blistering fast and would have been good enough to take 16th place in the men's division. Alena Sumner and Katharine Edmonson duked it out for the fastest American women, Alena narrowly edging out Katharine for 13th place. In C2, the top three places remained predictable with Grega/Sutek (SVK), Raus/Pecek (CRO) and Vala/Slucik (SVK). Bailey/Bailey (USA) took 6th in front of Lyda/Scnurenberger & Harris/Davis. After (K1) Roberto Pontarollo's (ITA) spinout in the World Cup #2, he was visibly focused and wound up to prove something here today. And prove it he did, dominating the day and winning by over 1.5 seconds over Florian Wohlers (GER) and the wonder kid from the Czech Republic Kamil Mruzek (CZE). Olympic slalom star Eric Giddens was the fastest American man finishing in 18th in front of Hipgrave (21), Tilghman (22), Hammond (23) and Krissoff (24). Simon Beardmore unfortunately snapped his paddle at the start of his second run, despite posting a great time on run number one. So after two days of racing, concluding with a grueling day of sprints, we now get a day off to recover and get ready for the final two World Cups on the Limestone section of the Kern. Limestone should be a very exciting race with some big water moves to be made and very little flat water. racers in spite of a serious shoulder injury. 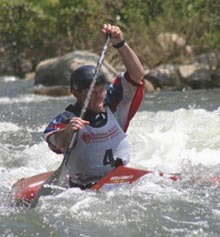 event at the Cable Section of the Kern. Chris Hipgrave blasts through a chest wave "like budda". Bob Bofinger picks it up in the flats. Michala Strdanoa of the Czech Republic.